It can be tricky finding nutritional, tasty and appealing foods for dairy free kids. 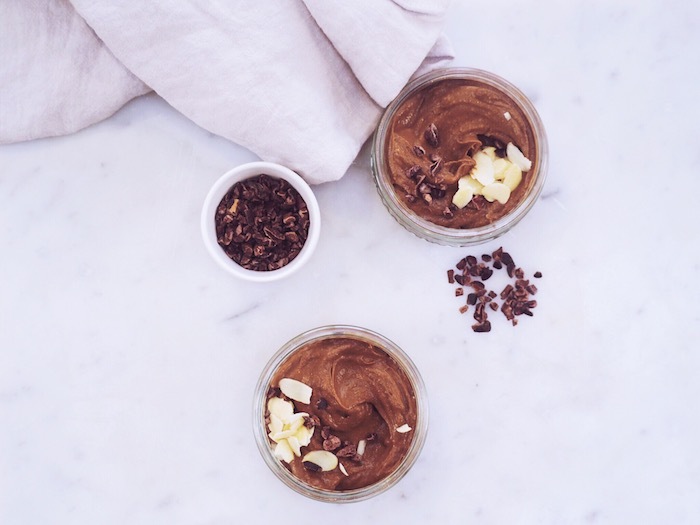 We’ve called on food writer and author Katriona MacGregor and nutritionist Emma Louise Pauline to share with us their five recommended recipes which include essential nutrients and minerals, as well as some delicious vegetables! This pudding should be in every parent’s toolkit! Plant-based and naturally dairy and gluten free, it also packs a serious nutritional punch. Avocados are our favourite ingredient, providing a rich creamy consistency as well as being full of healthy fats, fibre and minerals. With calcium, magnesium, iron and potassium all included in this recipe we love serving it knowing how much goodness our children are eating up. Unlike most pudds, these pots won’t cause a blood sugar spike and are so sustaining, they can even be served for breakfast. We recommend making double quantities because we don’t know many Mums and Dads who are able to resist these! Place the dates in a small bowl and cover with 3 tbsp boiling water. Leave to soak for 30 minutes. Half the avocados and discard the stone. Scoop out the flesh and place in a in a food processor or blender with the remaining ingredients. Blend until smooth and creamy. If the mixture is too stiff and thick add a little more coconut milk and blend briefly again. It should be the consistency of whipped double cream. Stir in the chia seeds and then divide the mixture between four small serving dishes. Cover and chill in the fridge for 2 hours before serving. If you like sprinkle some chopped nuts, cacao nibs or berries on top to serve. Nutritious dairy-free breakfast ideas for little ones can be tricky to find, especially if you want to make sure they’re getting all of the minerals they need. 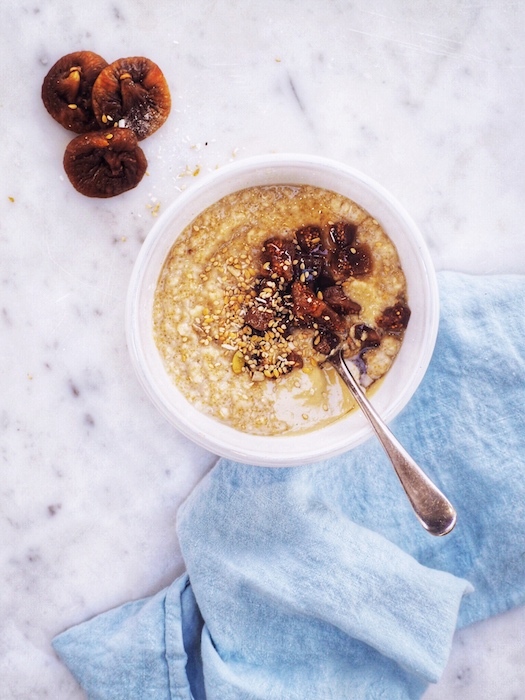 Much higher in calcium than other grains, amaranth makes a delicious porridge which our children love, made especially nutritious by the addition of calcium rich figs and tahini. The figs and honey provide just the right amount of natural sweetness needed to persuade tricky customers! Begin the night before by soaking the amaranth and oats in the milk of your choice. Simply tip into a bowl or container and pour the almond or coconut milk over the top. Cover and chill in the fridge overnight. To make the porridge, tip the soaked grains and milk into a pan along with the chopped figs and cinnamon. Place on a low heat and gently bring to simmering point. Simmer very gently for 15 minutes, stirring every so often and adding a little more milk if the porridge seems too thick. Taste the porridge to make sure the amaranth is soft and then spoon into bowls to serve. Drizzle a teaspoon or so of tahini on top of each portion, followed by a little honey and the sesame seeds. 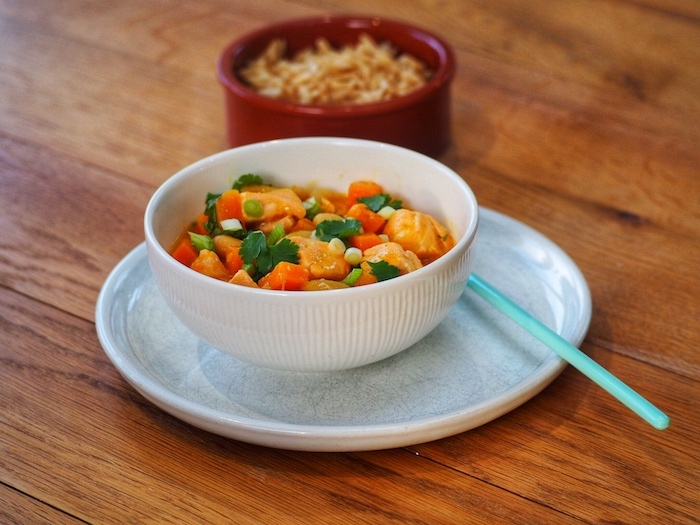 Super simple to make, with just a handful of nutritious ingredients, this recipe is a delicious one-pot meal for children. High in calcium, the cannellini beans make sure that children on a dairy free diet are looked after, whilst also providing lots of fibre and cofactor minerals. Taking only 20 minutes in the pan, this can be left as it is for older children or easily mashed for younger babies. We’ve used fresh salmon fillet but if your children won’t notice the difference, then canned salmon with bones provides even more calcium. Heat a little coconut oil in a pan and add the spring onions, butternut and garlic. Fry for 2 minutes until just softening. Cover with a lid and cook on a low heat for 5 minutes. Stir in the curry powder, followed by the beans and coconut milk. Cover and simmer gently for 10 minutes until the butternut squash is soft enough to break easily with the back of a fork. Stir in the chunks of salmon and coriander and simmer for 1 more minute. Remove the pan from the heat, cover with a lid and leave to sit for a couple of minutes before checking that the salmon is cooked through and serving. We like to serve this with sweet potato, brown rice or steamed broccoli. Smoothies are an amazing way to boost the number of veggies in your children’s diet whilst providing plenty of fibre and micronutrients. Created with those unable to tolerate dairy in mind, we’ve made sure there’s lots of calcium in this recipe by including chia seeds, figs and a fortified oat milk. This recipe also makes great ice lollies, meaning you can serve them for pudding, secretly getting some extra goodness in at the end of a meal. 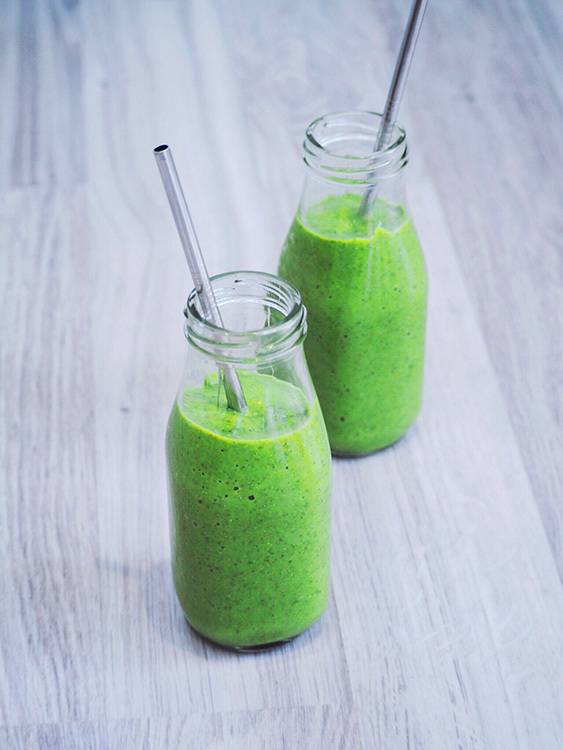 Our children love to watch these being made and seemed much more willing to try their first smoothie if we were having a glass too! 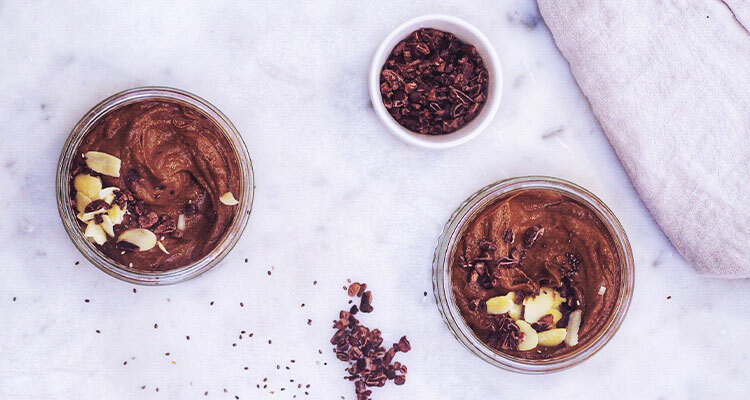 This recipe couldn’t be simpler!Place all of the ingredients in a blender and whizz until completely smooth, adding more water if it seems too thick. Decant into cups or bottles and serve with a straw. Alternatively pour into ice lolly moulds and freeze to be served any time. Serving smoothies as lollies is a great way to introduce reluctant children to these new flavours and also means that leftovers don’t go to waste. Tip – If you use milk alternatives make sure you check the labels to make sure there aren’t any hidden sweeteners or additives. Always choose fortified options if available and if you like coconut milk, make sure to check it isn’t made with rice for children under 5. This is a brilliant recipe to sneak oily fish and veggies into fussy eaters who might sometimes be suspicious. Cooked gently with tomatoes and courgettes, the sardines are soft and easy to eat without any bones being noticed. One of the best non-dairy sources of calcium, sardines also contain Vitamin D – vital to help the body absorb and utilise calcium. 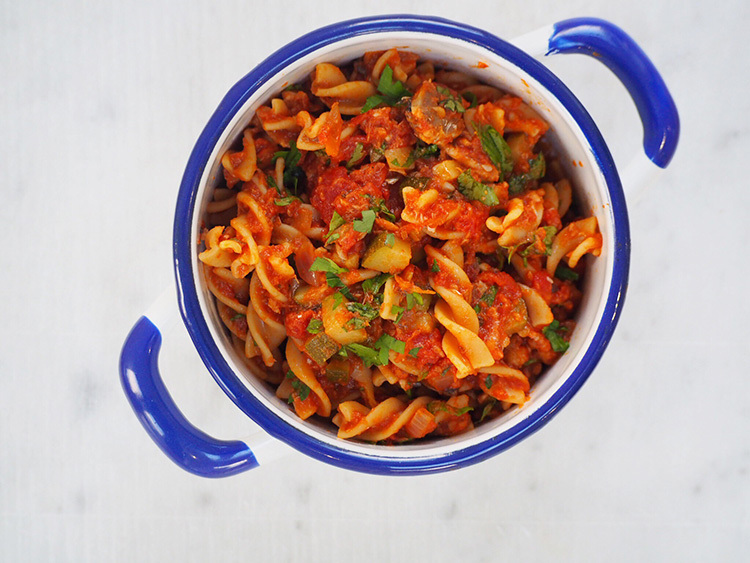 We like to serve this with chickpea pasta which contains more protein and fibre than regular pasta whilst also being gluten free. You can easily add more veggies to the sauce depending on your family favourites. We’ve found that olives, broccoli, carrots and spinach all work well. Cook the onion and garlic in a little coconut oil over a medium heat for 5 minutes, until just softening. Add the diced courgette and continue to cook for a further 5 minutes, stirring every so often. Stir in the tomato puree over the heat, followed by the tinned tomatoes and water. Bring to the boil and simmer gently for 12 minutes. Drain the sardines and add to the tomato sauce, breaking up gently with a spoon. Add the balsamic vinegar and parsley and stir well. Simmer for a further 5 minutes. Cook your choice of pasta according to the packet instructions and stir through the sauce. Tip – For younger toddlers, this recipe blends well too – just add a little water to the mixture when you blend. Food Writer and author Katriona MacGregor and nutritionist Emma Louise Pauline, create nutritionally balanced whole food recipes for youngsters, to help parents include essential nutrients and minerals in their children’s diets as well as plenty of delicious veggies. New Mums themselves they found traditional kids recipes rely heavily on dairy and wheat, which young tummies aren’t always able to tolerate, so they often focus on alternatives, without missing out nutritionally.